A large chicken run is divided in half by a fence. During the summer, one side remains a run, the other is planted for the season (with the Three Sisters, at Earthius). In late summer, after all corn, beans and squash/zucchini are harvested, the chickens are moved to the garden to feast on the leftover greens. The side the chickens used to be in, now has highly fertile, composted soil with few grubs and destructive insects. This area is raked into rows and planted with winter and cover crops, like kale, brassicas, onions, garlic, and anything else that can survive through the winter. 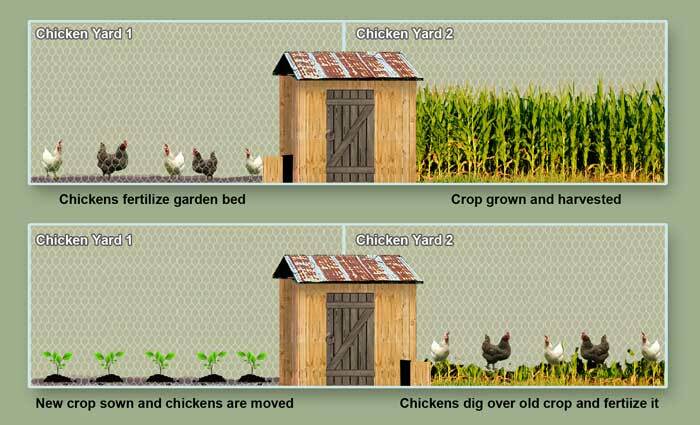 Meanwhile, the chickens do a great job of the other side, tilling under the remains of the summer crops and eliminating destructive pests. The chickens are nourished far better than with store-bought pellets (though we do supplement with mealworms and seeds). You've never seen and tasted such beautiful, nutrient-dense eggs!